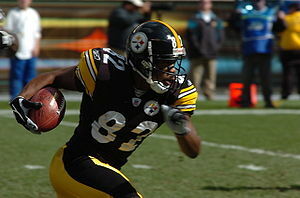 Randle El with the Steelers in 2005. Antwaan Randle El (born August 17, 1979) is an American football wide receiver, who is currently a free agent. He went to Indiana University, after turning down a Major League Baseball draft selection by the Chicago Cubs in 1997. At Indiana, he mainly played college football for the Indiana Hoosiers, as well as basketball and baseball. Randle El played college football for Indiana. In the National Football League, Randle El was mostly known for his two stints with the Pittsburgh Steelers. He also played for the Washington Redskins. In a Super Bowl XL win with the Steelers, Randle El threw a touchdown pass to fellow wide receiver Hines Ward. Ward left Pittsburgh that next year to play with the Redskins, where he was mostly used as a returner. Randle El played for the Steelers again in 2009. He is now a free agent. Randle El's younger brother, Marcus, was a wide receiver and kick returner for the University of Wisconsin, while his older brother Curtis was a defensive back at Indiana University. Antwaan is married to Jaune. The couple has four children: Eden, Aunnna, Arynn and Alexa. Randle El has a child, Ciara, with college girlfriend Tashia. Randle El also co-hosted Redskins Gameday on WTTG in 2007. Randle El has sometimes been a commentator, and is a Christian. This page was last changed on 15 October 2016, at 16:32.